A team of researchers with members from Nankai University in China and Rice University in the U.S. has developed a type of foam that retains its squishiness when exposed to extremely cold temperatures. In their paper published in the journal Science Advances, the group describes how they made their foam, how it performed under different temperature conditions and possible uses for it. The researchers note that almost all materials become more brittle and stiffer when exposed to very cold temperatures, often leading to loss of strength. In this new effort, the researchers sought to find a material that would spring back after being crushed while exposed to extreme temperatures. To that end, they looked to graphene as a possible solution. Prior research has demonstrated that sheets of graphene remain bendable and resistant to tearing under a very wide range of temperatures. To create their material, the researchers obtained small sheets of graphene and then cut them into very small shapes, which they connected together using oxygen atoms in a way that resembled a mesh. 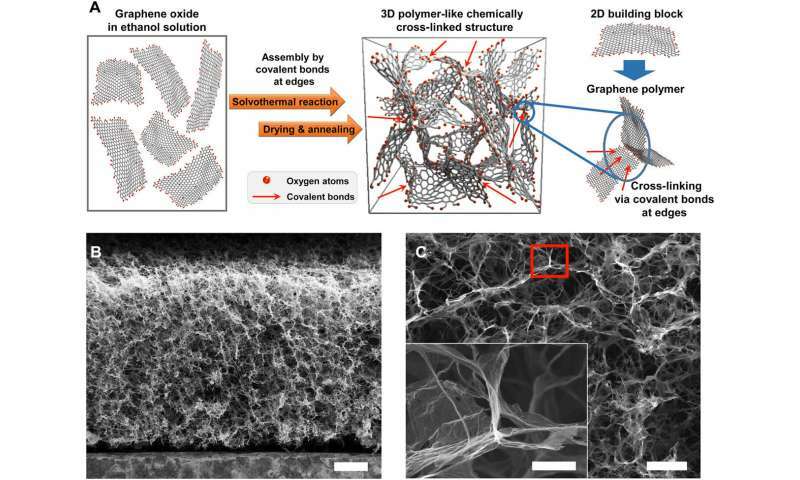 Prior research had also shown that oxygen-bonded graphene remains firmly connected under extreme temperature variations. The resultant product looked like a small, dark sponge. The researchers tested their foam by exposing it to both very high and low temperatures and then compressing it multiple times using a compression device they built. They report that their foam behaved the same at -269.15 degrees C as it did at room temperature. After compression to just a tenth of its original size, it popped right back nearly to its original shape. They report also that the foam performed well at high temperatures. When heated to 1000 degrees C it performed nearly as well on the compression tests as it did at room temperature. The researchers suggest their foam demonstrates that using super-thin materials like graphene can give rise to a foam with a unique property—they claim this might also be the case for other materials, such as those made with 2-D semiconductors or inorganic compounds. They also note their foam might prove useful for creating materials for use in space. Pack it with hydrogen, stimulate accordingly, next thing you know it's pumping ambient light for propellantless propulsion.